Comments regardiung these apartments look very favourable - and looking forward to our holiday here next week. Could anyone please tell me how much I can expect to pay - and what I SHOULD pay for a Taxi to and from the Airport to these partments? just got bk yesterday had an amazing time, met so many great ppl!! we loved it so much we booked to go again this yr 2nd october, cant wait to see every1 again,the owners and the staff were amazing, especially steve wot a legend!!! (hes hot aswell) counting down the days till we go bk!!!!!! wohoooo!!!!!!!!!!! Willie, Jamie (aged 9) and myself recently spent two glorious weeks at the Maistrali. We have visited the Island of Zakynthos for the past three years - this was our first stay at the Maistrali. We cannot fault anything, the apartments are spacious and spotless, staff cannot do enough for you and go out of their way to made your holiday an enjoyable one. Steve and Jackie at the poolside bar are wonderful company and make you feel like old friends, the food there is delicious. We have raved about this holiday to everyone since our return. We wrote in the visitors log that we hoped to return next year. We arrived home 29/5/06 and rebooked for the same two weeks next year on 30/5/06. Thats a recommendation!!! Just arrived back yesterday (05.06.06) from staying at the Maistrali Apartments and had a fantastic relaxing week with plenty of sunshine, great company and excellent food. We would certainly recommend the apartments as Stevie (behind the bar), Miltos the owner and staff could not do enough to make sure we enjoyed our stay. We both enjoyed the evening walk into Tsilivi where we enjoyed good food in The Olive Tree, Mano's Grill and Romio's. You will also get good food at the Maistrali Apartments and a big hearty English Breakfast all at a reasonable price. We are disappointed we missed the B.B.Q as everyone we spoke to had a fabulous time with plenty of food and drinks. We will certainly go back to the Maistrali Apartments - another thing no lack of sun beds around the spotless pool. Yamas and Efcharisto to Miltos and staff. We have just come back from our stay at the Maistrali Apartments and it was Superb. It was great . The owner Miltos and his staff Steve, Verola, Jenny, Reize and Pedros were all great friendly people and made us feel very welcome there. I enjoyed it soo much I am in the process of booking a holiday to this apartment in September. The location is ideal for people who want to relax and the main resort Tsivilli is a few minutes away by taxi. I cannot say enough to tell you all how great this place is. Recommended. We enjoyed our stay during June 2005, weather was gorgeous and our balcony had the evening sunset - perfect for sitting out on whilst sipping an ice-cold Mythos before heading off to Tsilivi. The walk to Tsilivi was ideal for building up an appetite but we were glad of a taxi ride back to the apartments later. I visited the Maistrali apartments twice in 2004. It was absolutely fab. My Husband had never been to Greece before, but liked it that much we went back the same year. It is friendly, quiet, clean, reasonable priced and the people running the place cannot do enough for you. If you want night life, Tsilivi is very near in a taxi, but we didn't need it. The bar stayed open for as long as Miltos and his staff had enough (which was invariably very late). We have just returned from a week at the Maistrali (after having been for a week in July this year, too). The rooms and complex are superbly clean and well-organised - we really enjoyed it. Staff are fantastic - and made everyone feel welcome. With all our best to Voula, Jenny, Petros etc....see you soon !!!!! We have just booked a holiday for next August 2006 at these appartments. Can't wait . Can anyone tell me how far we will be away from Tsilivi. We are travelling with a teenage couple who dont like to walk the length of themselves. are these any shops nearby or pubs. I JUST RETURN FROM TWO WEEKS VACATION FROM MAISTRALI HOTEL.IT WAS JUST GREAT.IF YOU ARE LOOKING FOR GREAT HOLIDAYS THAT'S THE RIGHT PLACE.I MET SOME GREAT PEOPLE SUCH AS JENNY AND VOULA IN THE RECEPTION AND REIZI IN THE BAR.BUT ALL THE MONEY IS MILTOS AND PEDROS.MILTO'S COCTAILS IN THE BAR ARE FAB AND IN A REALLY GOOD PRICE.AND ABOUT PEDRO HE WILL MAKE YOU FEEL REALLY WELCOMED.IF YOU VISIT THAT PLACE DON'T MISS THE CHANCE TO TASTE THE MAISTRALI MENU.JUST GREAT!!!!!!!!!!!!!! Without doubt the best complex i have ever visited, Fantastic staff, they cannot do enough for you. Pedros the handyman is a star, he cleans the pool, waters the flowers, works the reception and even does the barbie on the Greek night, what a trooper! The bar man (with the beard and grin) is dangerous, he will make you drink lethal cocktails of sambuca & tabasco sauce... VILE, but gets you in the party mood, would recommend these apartments to anyone, aged 18 to 118! My girlfriend and I have just returned from a two week stay at the Maistrali. It was absolutely fantastic here. We do like a little nightlife and the buses are very unreliable so we did have to get a lot of taxis, which did burn holes in our pockets but we cannot fault the location on that because it is so nice and quiet. The appartments themselves were very clean and airy. The only thing wrong was we had a few ants coming from behind a plug socket but a good crack of a towel scares them away (if anything, it's interesting to see how they work together! lol)! If you're thinking of a quite holiday that's not too far from life, then stay here. Rent a scooter (only 15 euro a day) and getting around is no problem but get a REAL road map or else you will end up lost in the mountains! Would anyone be able to help me with an agent in the uk who is selling these wonderful apartments for 2006? We went last year and had a truly wonderful holiday. We had a wonderful two week holiday with another middle aged couple! The apartments were clean and had everything we needed. It was quiet when we were there June 17 to July 1st, which is how we like it. Voula, Jenny and Pedro were great fun and did everything to make our stay enjoyable. Ampula beach was superb as were the Tavernas and beach bar. The best for an evening meal was the Akroyiali (second on right down the hill towards Ampula beach). Say hello to Bill and Leonardo! Supermarket across the road has everything you could want. This is definitely the better end of the island. 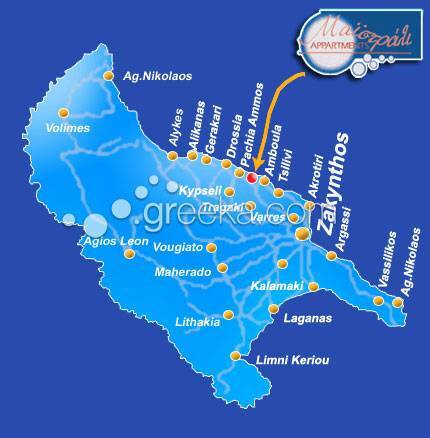 If you want loads of nightlife and 'kiss me quick hats' go to Kalamaki and Laganos... yuch! Me and my fiance returned yesterday from a 2 week holiday here. It is a great place. The apartments are very clean and airy. All the staff are very friendly and helpful. The resort is quiet, which is nice, but if you are looking for a bit of nightlife then a cab into Tsilivi is 7 euros. Well worth a look in Tsilivi are the following restaurants - Piero's, Nemesis Restaurant and also Calypso for a good old english meal! A 5 min walk from the Maistrali apartments is Ampula beach and is also worth a visit. You can rent two sunbeds and an umbrella for 6 euro's for the whole day and there is a beach bar and the sea and beach are perfect - remeber to pack your snorkel!! We will defintaly be back for another 2 weeks in the future. We have no hesitation in recommending the Maistrali apartments. Keep up the good work Voula, Jenny, Pedro and the gang!!! have just returned from a two week stay - really enjoyed it. We are all middle aged (unfortunately) and enjoy a peaceful holiday. Apartments really clean and tidy, very quiet area with a beautiful beach nearby called Ambolla. If you do go please give Voula and Jenny the Receptionists regards from England. They were so lovely we promised to put their names on the internet. Didnt like Tsvilli - very busy. Excellent restaurants on the way down to Ambolla Beach especially the fish restaurant (2nd one going down the hill) Leonardo and Bill will really look after you - fantastic food. Me & my boyfriend Jonny stayed here last summer, we had the best time ever! We have booked to stay again in August 2005. Apartments are lovely, staff are very helpful & friendly. It was a little far away from the nightlife, but we think its well worth it for some peace & quiet through the day! Overall very relaxing and peaceful holiday. Would definetely recommend to anyone. Just returned from one week at Maistrali Apartments - It was near enough to Tsilivi to be able to walk there, but far enough away to be quiet and relaxing. Apartments were very clean, staff friendly and facilities good. We had a great holiday and want to come back in august 2005 with friends ,but cannot get in touch with an agent in the UK to book up, so can anyone help.